Spring (or frühling auf Deutsch) is when the worker bees of Frankfurt start to shake off the long, cold, grey winter and make the most of warmer weather in this international metropolis. The weather may not truly warm up until May, but the first signs of a changing season mean it is time to forget business for a little while. Look at the city from on high, find some green space, and order a glass of ebbelwoi. These are the top 7 things to do in Frankfurt in spring. Germany's city of skyscrapers, Mainhattan, is best viewed from above. At 200 meters (240 meters including the antenna), Main Tower is part of the impressive skyline and a landmark for the city of Frankfurt. 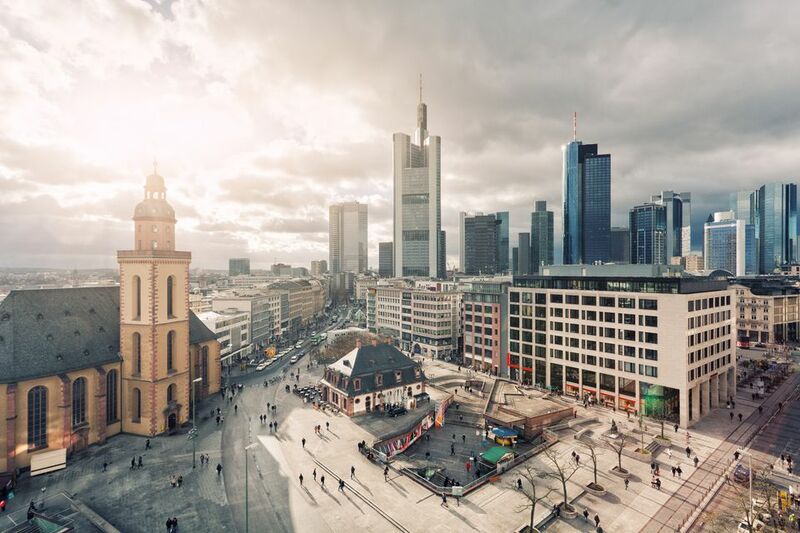 Take a moment to get the best view of the city from Main Tower's viewing platform and admire Frankfurt in the changing light. Elevators whisk visitors up to the observation deck 650-feet in the sky every day of the week. If you want more than just a view, order a cocktail or a full meal at the Main Tower Restaurant & Lounge with its 26-foot panoramic windows. Dippemess is the largest and oldest folk festivals in the Rhine region and centers on the Festplatz (Fairground) on Ratsweg. The fair dates back to the 14th century and was a market for local goods like pottery. And there is always a bit of beer drinking. Today's fest is better-known for its modern carnival rides, roller coasters, and fireworks. If you miss the festival, take heart that it actually happens twice a year: once in April and at the end of September. The Botanical Gardens in Frankfurt, Palmengarten, are an oasis int he city. Though the flower house provides visitors colorful blooms year-round, spring is the absolute best time to visit the gardens. Founded in 1868 by the city's citizens, it offers a temporary getaway to exotic lands like the African savanna or Brazilian rain forest. The gardens cover over 50 acres with multiple ​greenhouses and close to 6,000 botanical species. Spring is the perfect season for apfelwein (or ebbelwoi in the local dialect) in Frankfurt. Don't mistake apple wine for cider; it is crisp and unsweetened and the quintessential drink of the region. Go to the historic district of Sachsenhausen south of the Altstadt (old town) for the best and oldest apfelwein taverns. Visit traditional taverns like Dauth Schneider and Adolf Wagner. If you want to take your cider on the road, the Apple Wine Express (Ebbelwei Express) is a historic tram that combines touring with drinking. For the kiddos there is non-alcoholic cider and snacks. Everyone can enjoy the traditional Schlager music. Deck8 is a perfectly Frankfurt biergarten. Eschewing the traditional features of other beer gardens, the site is built on top of a parking garage and offers pools, palm trees, and views. If the weather fails you, a glassed-in area maintains the atmosphere while keeping off the drops. A relief from the winter grey, a trip to the woods is perfect for the whole family. At Waldspielpark, there is a large playground with a pool and nature maze for the kinder (kids) and a Goetheturm for the adults to climb. This tower is from 1931 and is one of the highest wooden viewing towers in Germany. The view of Frankfurt rivals that of the Main Tower. A walk along the Museum Embankment is best done in springtime. This promenade runs through the city center, lined with the best museums in Frankfurt. These include the German Film Museum, fine art at the Städel Museum, and Senckenberg Museum (one of largest museums dedicated to natural history in Germany). On Saturdays (from about 9:00 to 14:00) this area is a hunting ground for bargains as the site of Frankfurt's largest flohmarkt (flea market). It is much better to do your shopping when it is not raining.